Welcome to our new series, Piercing 101. Over the coming weeks, we're going to be bringing you the details of every type of piercing you could want. By the end, you'll know your tragus from your conch, and you may have even been persuaded into taking the plunge. Because look at those jewellery-adorned ears—it's tempting right? The rook piercing is one of the less usual inner-ear piercings. The tragus and the daith tend to be more popular choices, but who wants to look the same as everyone else? Plus, the rook piercing is versatile you can choose either a bar or hoop, unlike the daith, which is better suited to a hoop. No piercing is pain-free, but we wanted to find out how painful the rook is, how long it takes to heal and whether it will suit you, so we called on London-based piercer Rhianna Jones, who is based at tattoo parlour The Circle in Soho. Keep scrolling for her expert take on this beautiful niche piercing. BYRDIE UK: being an inner ear piercing, does this make the rook more painful? RHIANNA JONES: I wouldn't say it is any more painful than other [cartilage] ear piercings. BYRDIE UK: Does the rook piercing suit everyone? RJ: The piercing is suitable for most, but as each person's ear anatomy is different, a small number of people may find they are not able to get it. I will always work with each client to try TO position jewellery to best complement both their anatomy and any existing piercings. 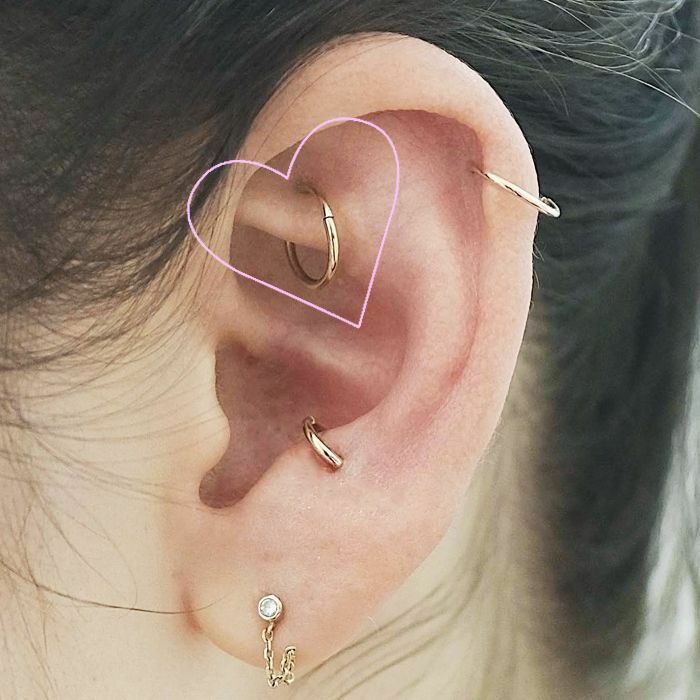 BYRDIE UK: What type of piercing do you pierce with: hoop or bar? RJ: For the initial healing period, I recommend a bar. I offer a range of jewellery in titanium or 18-carat gold in a wide selection of styles. I charge the same for any ear cartilage piercings with the actual cost depending on the jewellery you choose. RJ: A rook piercing can take anywhere between six and nine months to heal. As with any piercing, this is dependant on how well you follow your after-care and your general health. After-care should be followed until the piercing is fully healed as recommended by your piercer. It is always advisable to try to avoid sleeping on any new ear piercing until fully healed as it can cause problems and delay the healing. BYRDIE UK: How do you recommend finding a piercer? RJ: Always do your research before getting any piercing, check out their website and ask around for good word of mouth. Follow Jones on Instagram: @rhiannajonespiercing. Next up, check out what a daith piercing is.